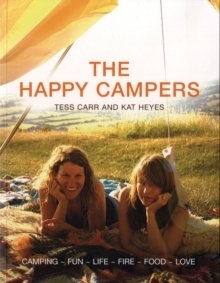 The Happy Campers is an inspirational and practical guide to 'happy camping'. Packed full of practical tips and brilliant ideas from where to go and how to find a good campsite to how to set up your camp and build a campfire, this book will also show you the magic of camping. with chapters on delicious recipes that have been invented collected and cooked over years of camping, how to entertain yourselves at camp, the wild world around us and even some soulful moments like a star gazer map to help you identify those constellations and a meteor shower calendar to spot a falling star. Shunning the survival techniques and hi-tec equipment that camping has become all to well known for this book takes a more spontaneous, relaxed and eco approach. Whatever your level of camping expertise this inspiring book will accompany you from coffee table to wilderness on your own unforgettable journeys. This beautifully produced, informative book will be the camping book for the ever increasing hordes who love sleeping under canvas.